This time of year whenever anyone in the house tells me they aren’t feeling well, the first thing I do is make a big pot of Chicken Soup, Italian style! With all the running around for the holidays and exposure to so many people and going in and out from the heat and then the cold, is it any wonder that my whole house is sick. 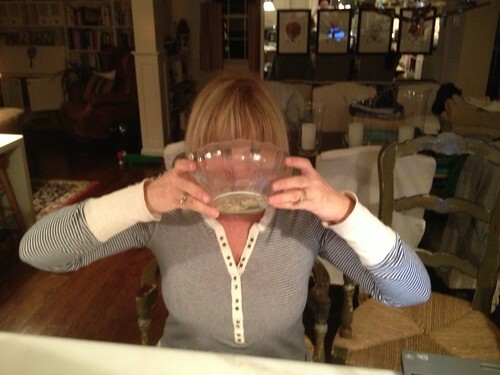 So, out comes the soup pot. My grandmother always added a healthy dose of raw garlic cloves, fresh dill, parsley and peas to her chicken soup. I buy a whole organic chicken (I don’t kill it myself like they did) to get all the benefits of bone broth. That is what she told me was the benefit of starting with the real deal. I always hear people say it is too hard to start from scratch, but that is so not true. Other than washing the chicken and chopping a couple onions and celery and a few herbs, there is not much else to do. Prep time is max, fifteen to twenty minutes and then you just wait for it to cook. How hard is that? I even skip cutting the carrots and wait till it is done to cut them. Come on, you can do that! The result is so worth it and you can always make enough to freeze half for later! Smart huh? The old ways seem to always be the healthiest and tastiest and your family will benefit from the extra effort. We all need to slow down and savor the moments. The news seems to be always full of the latest tragedies, so take the time to share the simple act of cooking with your loved ones and turn it into a family tradition to share with generations to come. They don’t need elaborate gifts, what they really need is quality time with the people they love. That is the real Italian style! 1lb any style small pasta such as Orzo, Alphabets, Pastina etc. Wash and dry the chicken and place in large soup pot and cover the chicken with cold water, about half way up. Add the onions, celery, carrots, garlic, dill and parsley as well as the salt and pepper. Add frozen peas last 5 min. Bring to boil, then lower to simmer for 2 hours. When done, remove chicken and shred and return to pot. Cut the carrots and return to pot. Serve over pasta or alone. You will be rewarded with delicious homemade soup that you can take pride in knowing you prepared with your own hands!